You’re at the airport. Your flight is cancelled. Nobody knows why. The only answer you’ve been given is totally lacking in information and, based on the number of times you’ve heard it, sounds robotic. Would you shrug it off and walk away? What if every time you went to the airport the same thing kept happening, and what if every airline representative you spoke to reminded you that you are among only a small percentage of people who’ve been affected? Would that be acceptable? What if the airline assured you that they’re trying to figure out the problem by setting up a call center and by spending a million dollars on tests that so far have yielded the same result: Nothing is wrong. Now add insult to injury and imagine if a writer for a well-known publication wrote an article about the flight cancellations and told you to chill out, simply because you’re only 10%. I have a feeling you’d be furious. Multiply that anger by a thousand and you’ll have an idea of how I feel after reading a story on Forbes.com the other day about the new uniforms that American Airlines flight crews are wearing and the reports that thousands of crew members are suffering health problems as a result. Long story short, I’m one of those flight attendants. One of the 10 percent. I get sick every time I go to work. Personally, I’d love nothing more than to take a break. Problem is, I’m too busy being sick to take a break. Too busy going to doctors trying to figure out what the hell is going on so that I won’t get sick. Let the record state that I can’t prove that any of my health problems are in fact caused by my wearing the uniform. This is how the uniform manufacturer continues to get away with it. The burden of proof lies on me.It’s also why American refuses to recall the uniform. Because we have not yet been able to prove what, exactly, is making us sick. Never mind there are close to 3,000 of us who are in fact having serious reactions to the uniform, reactions that have eaten up sick time and has resulted in lost wages. Now let the record also state that every time I go to work I feel terrible. I’ve been a flight attendant for 20 years and I’ve never felt like this before. This is not a coincidence; so many other flight attendants have suffered a variety of ailments since the uniforms were introduced in September. From rashes and hives to serious respiratory issues. In addition, flight attendants for Alaska Airlines had the same set of health issues a few years ago with uniforms made by the same company. Even though their uniform tested safe, those illnesses must mean something. I have hypothyroidism. My thyroid has been stable for years. I get my blood tested every three months. My TSH has been below a 2 (normal) for years. After 6 days in uniform it rose outside of the normal range. I might have blown it off if I hadn’t read about the flight attendants at Alaska having thyroid issues after they were issued new uniforms by the same manufacturer (that have since been recalled). That’s all it took to get me to stop wearing the uniform. My doctor upped my dose of medication and I switched to look-alike uniform pieces. Problem solved, right? Wrong. I wish it were that simple. Now I feel sick when I’m around co-workers in uniform. When I go to work my chest gets tight. My heart races. I feel short of breath. I have to clear my throat constantly and I cough all the time. After my last flight, I lost my voice. I didn’t have a sore throat. I went to the ER when I started to feel dizzy. I felt like I was breathing through a straw. I felt like I might pass out when I tried to speak. That visit set me back $800. The official diagnosis was laryngitis and RAD (reactive airways disease). Now I’m the proud owner of an inhaler and a prescription for steroids. “You must be a little anxious about going back to work,” the ER doctor said after I explained to her what was going on and asked her to Google Alaska Airlines. Anxious. Yeah. Just a little. 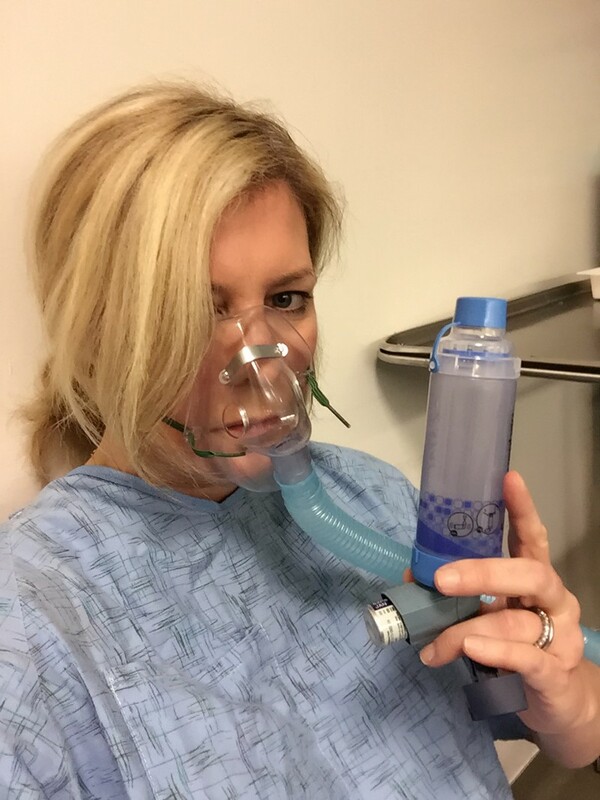 “Welcome to the club,” some of my flight attendant friends wrote on my Facebook page after I shared a photo of me in a hospital gown with a mask over my face and an inhaler in my hand. Two flight attendants shared photos almost exactly like mine. It made me laugh even though it’s not funny. I wonder what percentage of American Airlines flight attendants have been issued inhalers, steroids, or Epipens in the last four months, compared to flight attendants at other airlines. I wonder what percentage of American Airlines flight attendants have ended up in the ER in the last four months, compared to flight attendants at other airlines. According to American Airlines, the uniforms are safe. Over a million dollars in testing has proven it. According to American Airlines, it’s my grooming products that may have made me sensitive to whatever chemicals are in the uniform. Even though I’ve been using the same grooming products for years. According to American Airlines, it’s impossible for other coworkers in uniform to make me sick. They like to use the word “reaction.” According to American Airlines, the uniform will not be recalled…because it’s safe. Meanwhile, more flight attendants are getting sick (having reactions). I have a couple of problems with that statement. The 3 percent figure is out of the total AA workforce, not flight attendants which creeps closer to 10 percent. They’ve skewed the data. (It should be noted the writer, Ted Reed, states in his bio that he used to work for US Airways, which merged with American last year.) There’s a reason flight attendants are having more reactions to the uniform than other work groups. Environment matters. It makes a difference. We don’t work in an office. We work at 30,000 feet right on top of each other in a flying tube with recycled air for hours on end. Reed’s article is arguing for statically acceptable losses. If we were talking about babies getting sick, would 10 percent be an OK number? What about pets? What’s the number of dogs we’re comfortable watching suffer before something should be done? How about the brakes on your car? If you were part of 10 percent of people whose brakes didn’t work would that be OK simply because it’s ONLY 10 percent? How come it’s different for me? When Samsung had a problem with 733 washing machines, they recalled 2.8 million units. (.000026 percent). In my situation, 3,000 out of 27,000 flight attendants is a much higher percentage than the Samsung recall. Why are we being treated worse than washing machines? A flight attendant friend of mine spoke about the uniforms to a pharmaceutical executive who was sitting in first class. He said if ONE person taking a specific drug had the symptoms we’re having, the medication would be pulled from the market immediately. All I want is for the uniform to be recalled. Setting up a call center and spending a million dollars on testing is not enough. It won’t stop me from getting sick and ending up in the ER again. All I want is to be able to go to work without having a reaction to…we don’t know what it is yet. Everyone deserves a safe place to work. By everyone I mean even the 10 percent who keep getting sick. ME. The industry has the resources to pay for testing that says there’s nothing harmful in the uniforms. And yet, the number of sick flight attendants say this just isn’t true. As a flight attendant who works for the world’s largest airline, I’d like to remind people I’m more than just a number, more than a percentage. I’m a human being. I love my job. My health matters. Clothes shouldn’t make me sick. Is that why we have not heard from you? I really enjoy your articles. I am allergic to shellfish so I avoid it like the plague! If an article of clothing gives me a rash or some other reaction, I get rid of it. What I have learned after a few thousand dollars is even if you have had anaphylactic shock like I did, technically I was told by a team of doctors that very few people are actually allergic to bi-pods, mollusks, however I have had a deadly reaction from ingesting them (by accident) I am not really allergic? Great! I can eat shrimp? Well no, the doctors say,” you will never be able to eat shell fish again”. Every time you are exposed you become more sensitive. The answer is you cannot wear this brand of manufacturer! Period! I had FA friends who had their uniforms copied. Just make sure it is not the same fabric content as what you are presently wearing. Certainly, that should not be a violation I would think. Very sad to hear you are one of the many, many employees who are getting sick from the new uniforms you are required to wear for work. I was not sure who you worked for till this post, American Airlines. AA has been really, really nasty to me as a passenger. It doesn’t surprise me they would be that way to you as an employee. I guess I will never get to fly with you since I will not travel on AA. I really hope this can be worked out for you and your co-workers in your best interests. I know you love your job. I am the father of an AA flight attendant. She can wear the uniform but from an abundance of caution has destroyed hers anyway. Being actively involved with the aerotoxic issue, I understand this problem also. The chemicals used on the uniforms are dangerously carcinogenic. ANd yes Alaska and Fedex have the same uniform provider and suffer the same injuries. I’ve studied toxicology somewhat. 12% to 15% of our population are hypersensitive to chemicals. That means that passengers on your flight are also being impaired; probably after their flights and wondering why they are ill. Same situation with fume events. Trying to do something about it. Wow! This was very sad to read. I hope they (the airline) find a way to settle this issue for not only you but the rest of your coworkers. What scares me is if you are reacting this way to people who put on the uniform, how is it affecting passengers?